magicJack is excited to launch Rapid Renew, the newest and easiest way to add years to your magicJack service. By knowing your magicJack phone number, you can process a renewal, all without logging into your account! Click here. On this page you will see an option to start Rapid Renew. Enter your magicJack phone number in the box on the left side of the screen and click “RENEW NOW” to begin processing your Re-Up.Not sure of your phone number? Dial 0000 from your magicJack phone to hear your phone number! Review your renewal order. 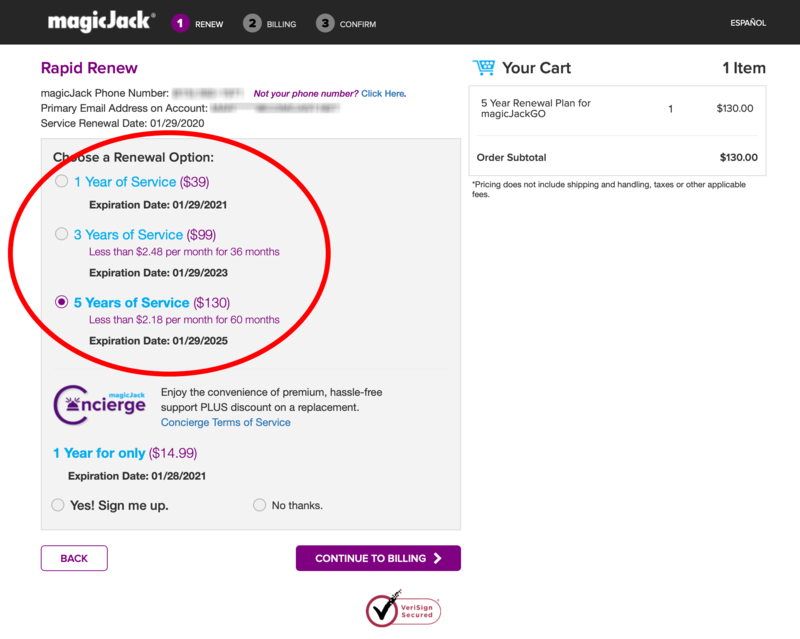 Confirm you chose the number of years you’d like to add to your magicJack device. If you need to edit any portion of the order, click “Edit”. Information you’ve provided will be saved so you can quickly adjust and still process your renewal order quickly. 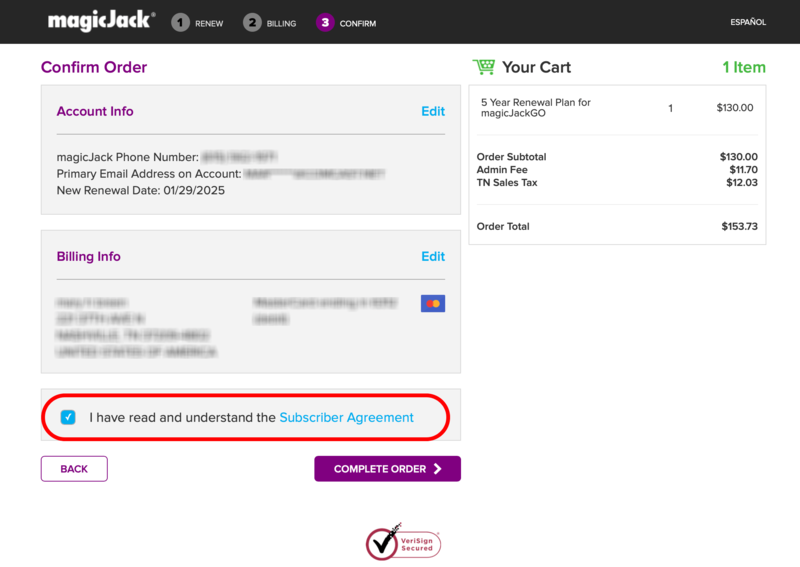 Check the box to confirm you’ve read and agree to the magicJack Subscriber Agreement then click “COMPLETE ORDER” to process your renewal. It’s that simple. You can now relax and enjoy your magicJack service without interruption. Your renewal should reflect immediately; if it does not, please unplug and re-plug in your device. AS A REMINDER: if you have a premium phone number, such as a Canadian phone number or vanity number, you will need to login to your magicJack account to renew that phone number separately. If you’d prefer to login and renew your service, that’s still an option. Enter your email address or phone number and password to login and get started. Once you login, click “ADD MONTHS” next to the device that you wish to renew and complete the purchase. 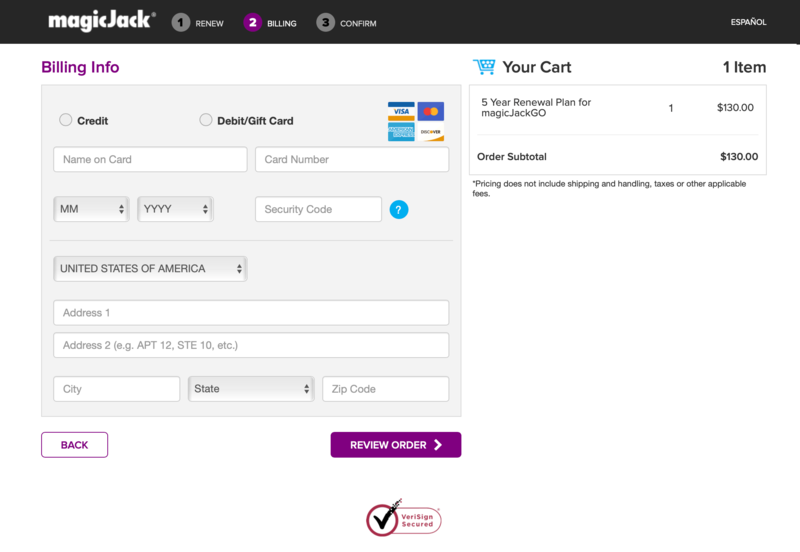 This magicJack site is VeriSign Secured, which means our site is verified and SSL secured. Our website was reviewed by Symantec and upon passing the strict verification rules, we received this security certificate. You can provide this private information with confidence and trust that it will remain secure.